Recent decision of Swiss Federal Administrative Court (see 2C_895/2013) has a dramatic impact on how foreign hybrid business entity is classified for fiscal treatment in Switzerland. This particular case concern US limited liability company (LLC) but extends far beyond. 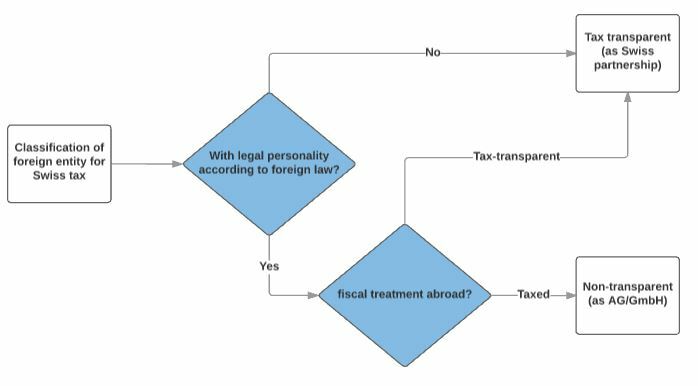 Key issue impacting taxation is whether a foreign entity is transparent for fiscal purposes (as Swiss partnership) or a legal person (like stock corporation (AG/ SA) or limited liability company (GmbH/Sàrl)). Usually, only legal persons can apply for relief under Double Taxation Agreements. In contrast to Swiss limited liability company (GmbH), US LLC is a hybrid business entity with certain characteristics of both a corporation and a partnership. An LLC has legal personality and its partners benefit from limited liability. However, for US income tax purposes, the pass-through taxation of a partnership generally applies (the check-the-box regulations allow US LLC to choose their classification and be treated as non-transparent). Ausländische juristische Personen sowie nach Artikel 11 steuerpflichtige, ausländische Handelsgesellschaften und andere ausländische Personengesamtheiten ohne juristische Persönlichkeit werden den inländischen juristischen Personen gleichgestellt, denen sie rechtlich oder tatsächlich am ähnlichsten sind. which was providing for criteria based on legal form, i.e. if foreign entity is a separate legal person under foreign law then it is also treated as a non-transparent separate legal person for a Swiss fiscal treatment (see for example 2C_664/2013 for the case involving Guernsey general partnership or Swiss Tax Conference “Practice Information regarding the tax treatment of US Limited Liability Company in direct taxes“). This approach was “tweaked” in the decision of September 18, 2015, to address mismatch of classifications that was happening with US LLC. Plaintiff unsuccessfully argued that even his US LLC was tax transparent for US taxes, it should be treated as a separate legal entity for Swiss tax law (with corresponding relief under US-Switzerland Double Taxation Agreement). According to the court, criteria described above is too simplistic and a “pragmatic mix of methods” is more appropriate. This basically added that the fiscal treatment abroad is decisive for the tax treatment in Switzerland. Correspondingly, foreign entity classification for Swiss tax purposes can be summarized by flowchart at the start of this post.Beware of these rules and carefully review your corporate structures involving US LLCs and other hybrid business entities. Beware of these rules and carefully review your corporate structures involving US LLCs and other hybrid business entities.